Family Caregivers are very important people. In fact, we have our own Bill of Rights! As a caregiver devoting yourself in every way to the care and support of a loved one, you have the right and duty to maintain a humane lifestyle for yourself and your loved ones. I imagine you thinking, “Oh I’m taking care of myself all right.” Read over the Caregiver Bill of Rights below and ask yourself if you are really exercising all your options. The Caregiver Bill of Rights. As a caregiver devoting yourself in every way to the care and support of a loved one, you have the right and duty to maintain a humane lifestyle for yourself and your loved one. Embracing these rights to the fullest, your loved one will receive the highest and best care you are capable of giving, and you may take pride in yourself. Maybe you don’t believe you have any choices, or that you’re ‘stuck’ in this role. And perhaps your options are limited. However, there are choices, and that’s what understanding your self-importance is all about. The greatest challenge facing you on this journey as caregiver is actually paying enough attention to your own self. Webster defines the word boundary as a line or thing marking a limit. I’m using the term to describe a place or position that gives you comfort of mind and honors your real feelings. And establishes for your self and others what you can and will accept and what you can’t /won’t –because it isn’t comfortable emotionally, psychologically, physically or otherwise. All right, I can imagine your anxiety rising right now because you would rarely say no to your family. You don’t want to displease or disappoint anyone. Boy, do I understand this feeling! So take a breath and sit back, let me share what I finally came to learn at 55 years of age. Establishing the parameters that make you comfortable emotionally, psychologically and physically matter every bit as what is comfortable for someone else. You have the right – no, the duty – to look out for you. When you find yourself hemmed in, think about how valuable you are and what a good person you are. Politely and firmly state your position and then — be quiet! The first person who speaks after you stop is in second position. Believe me, this works! Start practicing this over and over with all the scenarios you are conjuring up right now. Remember, a boundary is a position you take that establishes for you and others what you can and will accept and what you can’t/won’t because it isn’t comfortable emotionally, psychologically, physically or otherwise. You simply ask for what you want. What would you really would like from someone, and what can’t/won’t you do or accept? Sample Script: Joe, I can do this [blank] for Dad, and what I’d like to ask is that you contribute this many hours/days OR the funds to help cover outside help. Ask with a warm tone and then wait. Remember, silence makes people uncomfortable. Avoid the temptation to speak, because the longer you are quiet the more they know you are serious! If they give you a counter offer, think about it before you accept or refuse, and then continue, with warmth and appreciation in your tone, to work through to what is going to be satisfactory for you. This is easy. Remember what you asked for and they agreed to, and then stick to it. I’d love to have a workshop with you and practice the role playing around this. Would you like that? If so, click here to send me an email. For families to be in alignment successfully, there must be open communication, ongoing dialog, mutual respect for each party’s ability to contribute, and appreciation all around. 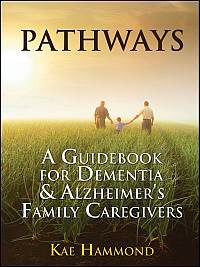 In my book, Pathways, I talk about forming your Helping Hands Circle. If you are the chief of this team, ask for what you want and need, and then invite their support. Draw up a list of needs and ask everyone to contribute in the way they can. And accept their offer to support you. Remember the Caregivers Bill of Rights? Send a copy of this to all your family and tell them you are honoring their rights while they are honoring your rights, too. I want you to know about a free, private, web-based community for organizing friends, family and colleagues — your “circles of community” — during times of need. It’s called Lots A Helping Hands. This is a free program where you can easily coordinate activities and manage volunteers using the intuitive group calendar. Here’s the link to this excellent tool that is easy to establish and maintain. It will keep you connected with your support team (family and friends) in a very efficient manner. Until next time, enjoy a daily cup of peace and remember: Your life matters, too.